There are few things students dread more than research papers. And there are few things teachers dread more than reading them. One late afternoon near the end of a spring semester, after grading many dry research papers, fifth-grade teacher David Somaza picked up a book on his shelves by Peter Lourie. As he began to read, he realized that the adventure writing was exactly what he had hoped to find in his students’ projects. 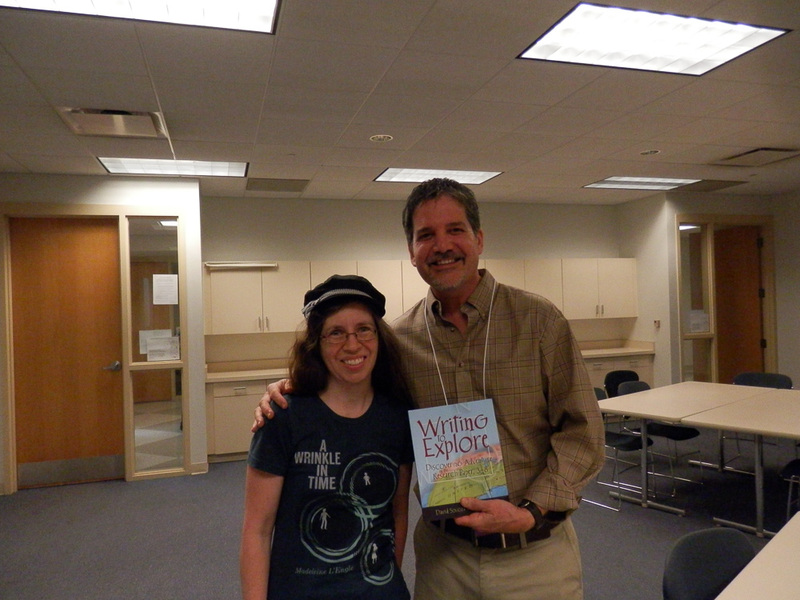 He called Peter Lourie, who had long been a friend, and talked about how to teach students to write interesting nonfiction based on adventure stories. Shortly after, Somoza tried to replicate the process with his students, the results of which he shared with Lourie. Somoza even invited Lourie to his class. After a time, the two realized that they had a lot in common with their writing and teaching, as well as love of travel, and they decided to write a book. That book is Writing to Explore, Discovering Adventure in the Research Paper. I first heard of the authors, and Writing to Explore, at Plum Creek Children’s Literacy Festival. Below are my notes from their presentation on how students can discover passion in research. Over the next few days, I’ll also review a few of Louries adventure books. Save the dates: October 28-30! Peter Lourie began with the disclaimer that Writing to Explore wouldn’t have come about, if not for having a teacher aboard. He is out in the field, but not in the school system. Next David Somoza talked. He shared of loving his job too, a career that he’s held for twenty-two years. There are obstacles and challenges in the educational field, but one just has to close the doors to the classroom and enjoy teaching students. 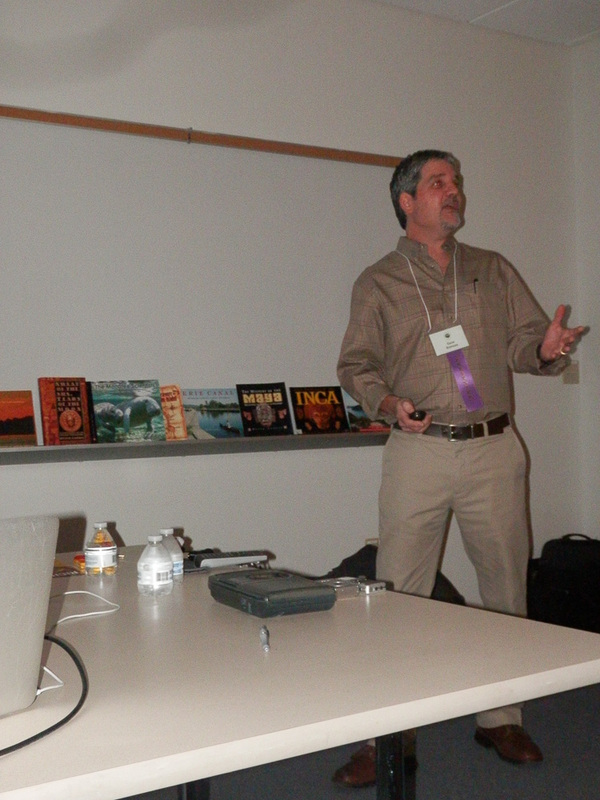 Somoza explained how initially writing and reading research papers was a boring process. Unintentionally, he would tell his students to read, write, and do nothing else. Then he read one of Lourie’s books, discovered he wanted to keep reading, and realized that was what he wanted for his students too. The two got together many times. One time they were both talking about writing and, out of that conversation, they decided to write a book. Lourie and Somoza worked together for four years on Writing to Explore. For Peter Lourie, his books are personal essays or literary travelogues. He views the writing of them as a simple process, similar to what kids have to do when doing research papers. Research is organic. So is writing. All writing depends on details. When doing research, what should one do first? Start with setting! You can use photos for inspiration, but cannot rely on them for portraying the background. You must do develop setting with your words! Next is character. For an adventurer, at the center, are the people you meet. What else? A setting or a character alone would be flat. Combine photographs for setting, music for characters, and turn into films to make a narrative. Move characters through a setting in a series of actions. Draw readers in with thoughts and emotions of the narrator. Setting, character, action, culture, and researched info are all woven together. TAPESTRY! How do you provide the skills set for setting? How do you help students provide a picture? Tell them students to just write everything down and then help them revise. At this point, Somoza would paste-up all the pictures and read the essay. Students guess whose work which it is. How do you provide the skills set for character? The goal is to retell the experience so that readers can imagine it on their own AND become engaged with the writing. Lourie and Somoza end their presentation by recommending Lucid Press, a web-based drag and drop publishing app that enables anyone to create stunning content for print and digital, it is free to educators. They also allow time for questions and signing of books. To learn more about how to write adventure narratives, check out Writing to Explore.